Match the stylings of two of the most revered jazz saxophonists, and you're likely to come up with The Cannonball-Coltrane Project. This five-piece ensemble pays homage to Julian "Cannonball" Adderley and John Coltrane. Bassist Luther Hughes says the idea came to him as he was listening to The Cannonball Adderley Quintet in Chicago (Mercury, 1959), the only time Adderley and Coltrane recorded an album together, when they weren't backing up Miles Davis. To make it work, Hughes brought together fans of the duo, tenor saxophonist Glenn Cashman and alto saxophonist Bruce Babad, along with pianist Tom Ranier and drummer Paul Kreibich. "McCoy" is an original tune, penned by Cashman, to Coltrane's pianist, McCoy Tyner. The saxophones harmonize in the lead, as they do on most tracks. Czach stretches out on the middle solo, followed by Babad and then Cashman. Throughout, Hughes and Kreibich liven things up in the background. Babad composed the ballad, "Primrose Star," one of the longer pieces in the set. Adderley is among many who have recorded the standard "Stars Fell on Alabama," whose chord changes are presented here. Cashman arranged the standard, "Softly as in a Morning Sunrise." At more than eight minutes, this piece gives the musicians plenty of room to play. First up is Czach. Cashman's tenor solo sounds, at times, like Coltrane, as he puts the instrument through several rolls. Hughes also gets some licks in. Babad cranks up the intensity when his turn comes up. The title song revisits Adderley's delightful melody, arranged by Babad. After the opening sequence, Babad takes off on a playful solo, followed by Czach and Cashman. Accompanied only by soft piano and drum play, Hughes takes the bass on a leisurely stroll. 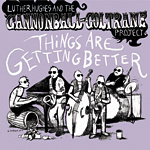 Things Are Getting Better has 12 songs and more than 70 minutes of music. 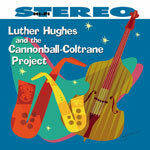 It's the Cannonball-Coltrane Project's fourth release, and aptly defines its progress as a unit. Track Listing: Jive Samba; Glo in the Dark; McCoy; Primrose Star; Softly as in a Morning Sunrise; Sunset at Hermosa; Blue Daniel; Samba Para Um Dia Chuvoso; Trane and Wayne; Things Are Getting Better; Green Bananas; Take the Coltrane. Personnel: Luther Hughes: bass; Glenn Cashman: tenor saxophone; Bruce Babad: alto saxophone; Ed Czach: piano; Paul Kreibich: drums, percussion.